Beautiful violet-blue flowers with a dark centre. Blue Poppy is a De Caen type anemone. 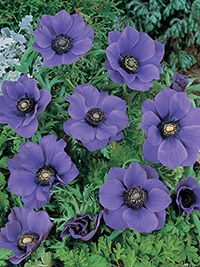 These are single anemones, meaning just the one set of petals. They flower from early spring and produce many stems over several months right through to the end of spring.